1) I look at Europe’s changing weather picture this upcoming week and warmer, sunnier end for Scotland. 2) I look at the building and expansion of heat across much of the US, east of the Rockies. 3) A detailed look at the early season drivers and mechanics of the Atlantic Basin Hurricane Season as wellk as possible early season development over the western Caribbean. Tightening Pressure Gradient to bring strong westerly winds across Scotland tomorrow, change is in the wind for next week! As you can see clearly from the above map produced by the European model for tomorrow (Sunday), a tightening pressure gradient caused by a strong upper low north of Scotland and high pressure not far to the south of England will create strenghening winds out of the west across all of Scotland. The tight isobars as you can see are running west to east and close together. By getting these isobars or lines of equal pressure closer together, this shows stronger winds. The closer low pressure and high pressure are located, the stronger the winds blow in between. The winds blow harder in order for the atmosphere and air to find equilibrium. By Wednesday, the trough dives into France and splits the heat. By looking at the map below for Wednesday, the trough narrows as is shown to b forced up the western side of the trough and this will pull markedly warmer, continental air across Ireland and perhaps western Britain, even up the west coast of Scotland, bringing the first 21C temperatures in a few weeks. Of course, the cool pocket and upper low will strip temperatures back to perhaps the 18C mark in such cities as Paris, after a run at 30C just two days previously. Southern Spain looks to see heat build back with the departure of the low out into thje central N. Atlantic, but the trough swinging into the north of the country from France will keep it cooler and unsettled. The heat remains strong to the east of this penetrative trough with eastern Poland, into Lithuania, Belarus, the Ukraine and western Russia remaining warm to perhaps even hot. In tomorrow’s post (Sunday), I shall discuss the Thurday through Saturday period but I will say this much. Going by the current model output, Britain may be in for quite the toasty end to next week as the upper low that’s currently diving into the UK now will cut off over France and strong high pressure will be shoved north and station itself over the UK. It appears the warmest readings of 2011 so far may be on the cards late next week with 30C in portions of England, 25C for Scotland’s Interior!! Scorchio growing stronger across Texas and throughout US, east of the Rockies! 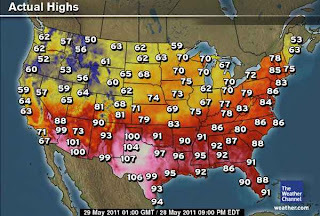 These where the highs reached today across the United States (see map below), what a differnce compared to recent weeks isn’t it? The scorching heat that’s been pumped north of the Mexican Desert baked Texas well into the 100s for a decond straight day with yesterday’s peak being 111 degrees at Dryden, Texas and today, 112 degrees at Laredo. This heat was hottest south of the border. According to the University of Cologne’s North America high temperatures for today, the Monterrey area of northeast Mexico broiled at 115 degrees. If you notice, once you got only as far north as Kansas, cool air was present, however, by looking closely at the upper-level geopotential height anomaly forecast maps below from the European, the ridge is going to really expand and intensify over the next 3 days. 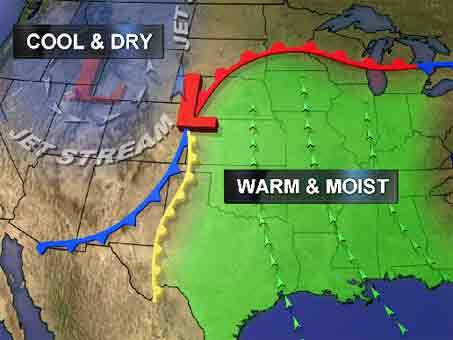 This will be aided thanks to an upper low diving southeastwards into the Pacific Northwest. The presence of this upper low helkps pull Mexican heat north and as it does so, the will pump the ridge northwards as well as eastwards. 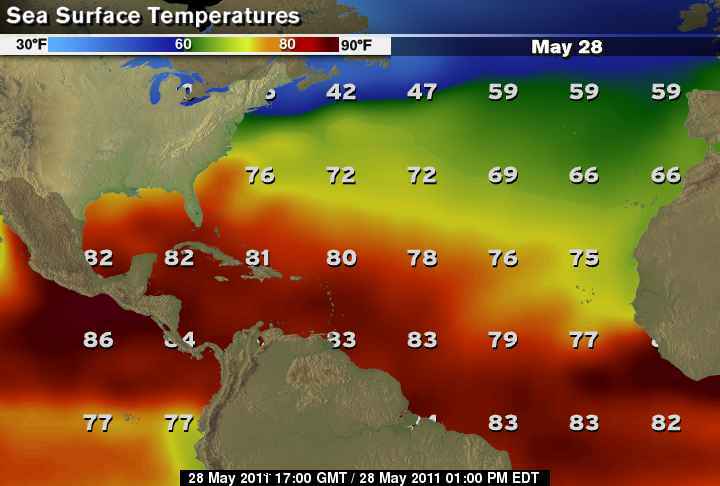 As you can see from the above map provided by The Weather Channel the Sea Surface Temperatures are rising. During the first 30 to 40 days of the season, we typically see development over the western side of the Atlantic Basin. 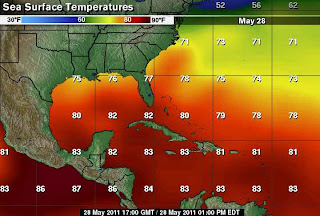 The above map shows why, waters are warmer at this point over the Caribbean Sea and Gulf of Mexico than they are further east. Though, high pressure remains dominant across the basin from Central America to Africa, the waters over the western basin, grow shallower as the ocean floor rises towards the American continental shelf. With both warm ocean currents flowing in and around the Caribbean and Gulf and shallower depths, this is why this area is warmer faster. 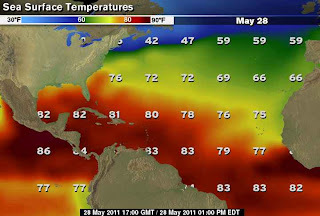 The eastern side of the tropical basin is much deeper, plus, the cold Canary Current runs down the west coast of Africa. The combination of this vastly deeper water almost directly off the African coast and a cold current running south from the Canaries means, the high pressure system has a harder time heating up the eastern Atlantic basin, once it’s heated up and this is usually by August 1st, then waves that ride the AEJ or African Easterly Jet can and do develop rapidly once out over the 80 degree + waters around the Cape Verde Islands. The long track or ‘Cape Verde Season’ doesn’t usually get going until late July into early August as reasons explained above. The atmosphere is typically more conducive further west and indeed further south. The jet stream and Sub-Tropical High Pressure belt takes a while to migrate to it’s northernmost position. Once it does so and that isn’t typically until late July or into August, you’ll see the persistent waves flow west to east off Africa and along the ITCZ (Inter Tropical Convergence Zone). At this point in time, the ITCZ is too far south but this along with the upper level high pressure belt will move north, positioning itself over North Africa’s Sahara Desert, it’s currently over the Sub-Sahar or Sahel region, which lies between the Sahara Desert and the equator. This region where the core of high is positioned, is heating up the region of the Atlantic where the Cape Verde season will run along, the the actual waves or seedings remain over the equatorial region at the moment. The same can be said for the North America side where the waves are forming way too far south to be a US threat. The early season is usually a threat to either Central America or Mexico, not the US, however that isn’t always the case. 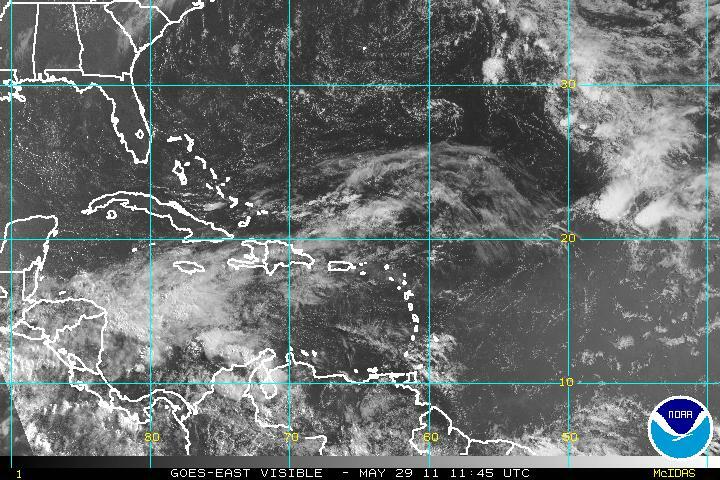 There is currently some stirring and clustering of clouds showing up on satallite imagery over the western Caribbean Sea. The atmosphere remains too hostile for these cloud clusters to develop into a closed-rotary circulation in which a warm core can be formed, however, both a relaxing of upper winds and models suggesting development, over the next 7 day period, we may be looking at the eseedlings to our first named system of the new season which starts on Wednesday (June 1st). A high built up over Cape Hattaras by midweek and lowering of pressures over the Caribbean Sea would suggest more incubation for this ‘wave’ to begin developing. I shall be keeping a close eye on this western Caribbean feature throughout the week and keep you posted as to whether this will develop into perhaps the first named system of 2011. Seasonal Low: By not deepening further, as is expected by now in the pre-monsoon days, the seasonal low seems to be staggering. The central pressure is today at 1000 mb. The gradient is weakening, and is required to get steeper in the next 2/3 days.Result of lower day temperatures in the northern plains last 3 days.The culprit ? M3. I would not worry much on this count, as days will suddenly heat up from Sunday. (Though M4 is expected by 31st May). A trough running down the eastern coast of India will be a fore runner in pulling up the SWM in the next 24 hrs to cover the Bay Islands, and, with the SW winds picking up there too, a larger area of the Bay will be covered. With the trough re-forming in the eastern regions, I expect the SWM to pull up in the NE states around 2nd/3rd of June. The Somali winds are strong enough now, and resultantly, the SST along the Somali coast has dropped to 20-22c. As explained earlier (in previous MWs), this, along with a high water temperature in the central Arabian Sea is needed to create huge Monsoon clouds in the central region. This is exactly the position today (28th). We see cloud masses in the central region, with the possibility of a system forming there by the 31st. As seen in the sat image above, a distinctly seperate cloud mass off the Kerala coast is the developing SWM cloud. With the monsoon having arrived in parts of Sri Lanka, pre monsoon showers have started in Kerala. SWM will cover the Sri Lanka entirely by 29th, and set up its advance into Kerala. 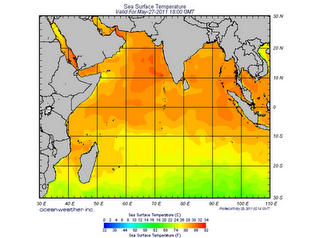 Should hit Lakshadweep and Kerala by 2nd/3rd of June. As of now, its further advance northwards will be maintained as per Vagaries’ forecast. Bay Islands will be covered totally by 29th, albeit as a weak current. SWM likely to advance into NE regions around 3rd June. 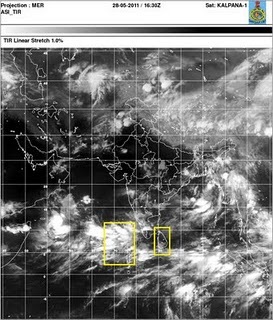 A system will form in the Arabian Sea by the 31st of May. This should deepen a bit, maybe up to a depression strength, move north/north-west, and fizzle out before making landfall. Hence, may effect the SWM. Mumbai: Sticking to the original forecast, Mumbai should get the first pre monsoon rains from the 2nd/3rd of June. 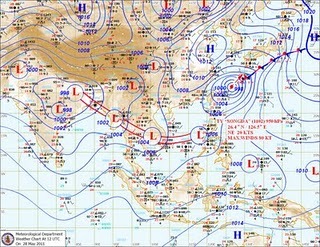 The Keila Hype- It is not even a low pressure yet!